"We can’t stop a psychopath from doing something hideous, but as lawmakers, policymakers, we need to take precautions," a state representative said. 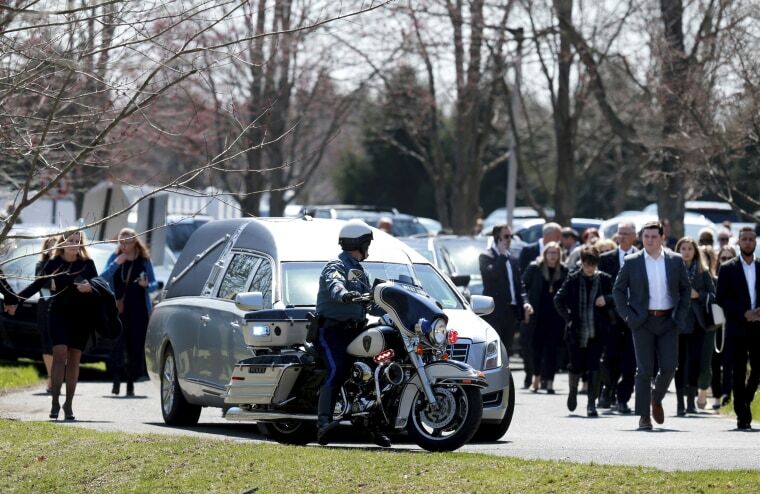 As mourners at a New Jersey funeral on Wednesday paid their respects to the college student who was killed after she mistook a car for her Uber ride, lawmakers in South Carolina, where she died, are pushing to require ride-share vehicles to be clearly marked with illuminated signs. Samantha Josephson, a 21-year-old University of South Carolina student from New Jersey, was killed last week. Investigators think she got into the wrong car early Friday while waiting for an Uber outside a bar in Columbia. A suspect has been arrested, and police say she apparently mistook his car for the Uber she ordered. Nathaniel D. Rowland, 24, has been charged with murder and kidnapping. The student's body was found in a wooded area in Clarendon County on Friday afternoon. Rowland was arrested after he was pulled over in Columbia early Saturday, police have said. Seth Josephson told mourners Wednesday that the family's "sadness will never end," NBC New York reported. "It may wane in the future, but it will always leave a hole in the heart," he said, while reading a statement on behalf of Josephson's family. Seth Josephson is a cousin of Samantha Josephson's father. Josephson's father, Seymour Josephson, has said he would dedicate his life to improving the safety of ride-share services. "Samantha was by herself. She had absolutely no chance. None. The door was locked, the child safety locks were on. She had absolutely no chance," he said at a vigil in Columbia on Sunday. In response to Josephson's death, South Carolina lawmakers have introduced a bill that would require all ride-share drivers to display an illuminated sign to clearly mark their vehicles. "We can’t stop a psychopath from doing something hideous, but as lawmakers, policymakers, we need to take precautions to make the likelihood that something like this happen less,” said state Rep. Seth Rose, a Democrat, according to NBC affiliate WIS of Columbia. The bill, the "Samantha L. Josephson Ridesharing Safety Act," was introduced Tuesday. It would require that "transportation network company" vehicles display an illuminated sign that can be seen in darkness. The current law requires a sign or emblem that is reflective. Uber and Lyft did not immediately respond to a request for comment Wednesday about the proposed changes to the law or about regulations they have regarding lighted signs. It appears from Lyft's website that its lighted sign, called "amp" is available to higher-tier drivers in some areas. Uber also has a lighted sign called "beacon" that is described as an option, according to that company’s website. The University of South Carolina on Monday announced a "What's My Name" campaign to help students stay safe when requesting ride-share vehicles. Uber announced it would partner with the university to raise awareness about safety. "Since 2017, we’ve been working with local law enforcement to educate the public about how to avoid fake rideshare drivers," Uber said in the statement. "Everyone at Uber is devastated to hear about this unspeakable crime, and our hearts are with Samantha Josephson's family and loved ones." Uber encourages users to check the car, license plate and driver against information delivered through the app before getting in. If the information does not match, do not get in the vehicle, the company says.